Maybe it’s because I’m a new mom or maybe it’s because we had a huge snowfall in November, but this year Christmas time feels different than any other year. It’s more magical. This year is the first year I put lights outside. This year is the first year I baked holiday cookies. This year is fun. But it’s still overwhelming. This overwhelm takes over my schedule. This overwhelm takes over my body as well as my mind. My body feels sluggish and tense and then my thought patterns follow suit. The only remedy – a good workout. Involve the kids. If you don’t have time to work out because you’re with your kids, why not involve them? Kids love to help! Babies and toddlers can be used as resistance or they can just watch and be entertained by what mommy’s doing. Bigger kids would love to join in. They just need to be told what to do and shown that it’s fun. Plus, this sets a wonderful examples of healthy habits and the importance of taking care of yourself. Set an intention. Just tell yourself that for the next two weeks you will move your body at least once a day and find a way to do it. Remind yourself that you will feel amazing after a little workout and that you will have clarity of mind. Remind yourself that you can do anything if you set your mind to it. I used to scoff at people who paid over-priced fees for something they could just do themselves, but I feel differently now. Now I’m more than happy to be one of those people. Hear me out. When you’re paying your own money for something, you take it seriously. Plain and simple. You’re way more likely to skip a free class rather than one you paid for because you’re motivated to not waste your money. Right? So if you can afford it, get a trainer or join a class and keep yourself accountable. If that’s not an option, commit to any of the tips below. Whenever my body needs a little reset, I turn to Youtube and Yoga with Adrienne. Of course, it doesn’t have to be yoga, and it doesn’t have to be with Adrienne, but I do love the fact that it’s a premade little package that has a beginning and an end. I can commit to anything for just two weeks, and I love that the thinking is done for me. A hidden bonus, my toddler is mesmerized watching me twist myself like a pretzel so I can do it with her in the room. If you have a tiny baby, they can lie on the mat with you, and if you have a bigger kid, they can just join in. The idea is pretty simple. Every day, for thirty days, you do 100 squats. All at once. Of course, if this is new to you, 100 squats will seem impossible. So start with just ten, then do ten three times a day, and then do twenty three times a day and then just work your way to one hundred. It sounds crazy, but it’s an all-in-one type of workout that’s both resistance and cardio. You will be amazed by the changes in your body. If you have a little one, you can get an even better workout by holding them, or you can get them to show you how it’s done. Kids love a challenge. On a day when nothing else is in the cards, I fit in a short walk and a short stretch. This is partly to get my cardio in, but mostly it’s to maintain my commitment to health and fitness. I have momentum of working out once a day, and I don’t want to lose it. If I can do it alone, that’s great. Otherwise I let my baby toddle along or babywear her and let her enjoy the crisp winter air. 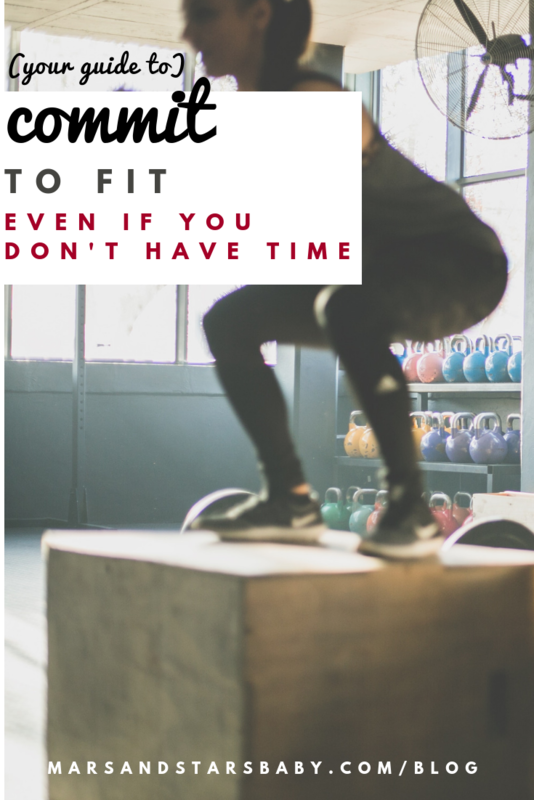 Making fitness a priority isn’t just a new year resolution. Commit to it today, and you’ll see a transformation in both how you look and how you feel. There’s no better time than now – the holiday overwhelm season. Let us know how it goes. Send us a comment on Instagram @marsandstarsbaby.